staff, assets, and more, 24/7! Wireless networks have made it far easier for M2M communication to take place through shortening the amount of power and time necessary for information to be communicated between machines. Monnit wireless solutions allow for a multitude of new business opportunities and connections between machines and people. Wireless networks can improve production and efficiency in various areas. For example, adding Monnit wireless sensors to a production machine makes it smart enough to let engineers know when it needs maintenance and what needs to be repaired. This type of information helps streamline production and keeps equipment working at the highest efficiency. 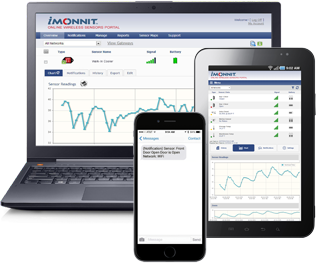 Using Monnit wireless sensors to monitor facility systems can provide cost savings in areas like heating and ventilation, area access, light, and power management. 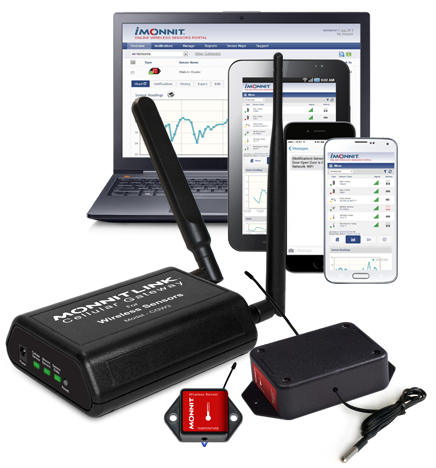 Monitor your property 24/7 via internet. Android and iOS apps are available, free of charge. » Evaluate mechanical movement, air flow, water flow, vibration, etc.